With pre-orders for the Verizon iPhone having begun only about nine hours ago, it appears that orders have already begun shipping. 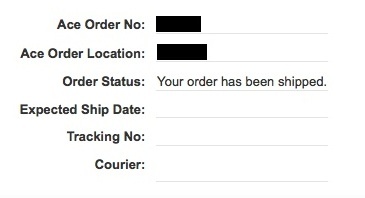 MacRumors reader Brooks Serigne has passed along this screenshot of his order status screen on Verizon's website showing that his order has been shipped. No carrier/tracking information or delivery estimate has yet been provided. In its Verizon iPhone FAQ, the carrier notes only that pre-orders will arrive "on or before February 10, 2011", but it appears that Verizon already has units packed up and ready to go and is moving them on their way to customers. I got the Zagg Invisible Shield for mine. Put it on myself. Looks really good. Can't even tell it's there really. For the money It was a good investment. It's going in a case eventually, but I wanted protection for it when it's in the case as well since they seem to get scratched up while in the cases. After reading that do you seriously not know which one he got?